Short post tonight because tomorrow is the last time the Bank of Canada will make its target interest rate announcement with Mark Carney as governor. I know that it is too late for you to go out and make millions on interest rate predictions but the target overnight rate staying exactly the same is a pretty sure bet at this point. The BoC is reporting core inflation of only 1.1 percent which is about half of its target. If you ask them they will of course say inflation will return to 2% all by itself near the end of their forecast horizon. But, if for some reason inflation were to stay stubbornly low then the BoC would actually want to lower the target rate. I would really like to see the total meltdown Ron Paul enthusiasts and real estate bubble doomsayers would have in the comment sections and forums if the target rate was lowered tomorrow, but the chances of that slim to none. With the recent threat of an LCBO strike over the May long weekend we are again hearing cries for the privatization of liquor stores in Ontario. “Down with the Monopoly!” they cry. It seems like a good time to take a few minutes to look at what would happen if liquor sales were privatized. First thing to do is establish how much we are currently spending on our booze. After reading this article I would like you to ask someone you know why liquor prices in Ontario are so much more expensive than they are in say… Michigan. The answer you will get in a large number of cases is that the prices are so high because of the tax. The person will then go on a minimum two minutes rant about taxes. There is actually no real mystery to where the high prices come from because the LCBO publishes their pricing scheme online and although there are a lot of taxes applied to booze, that is not where the majority of the price differences come from. My spirit of choice is Whisky. 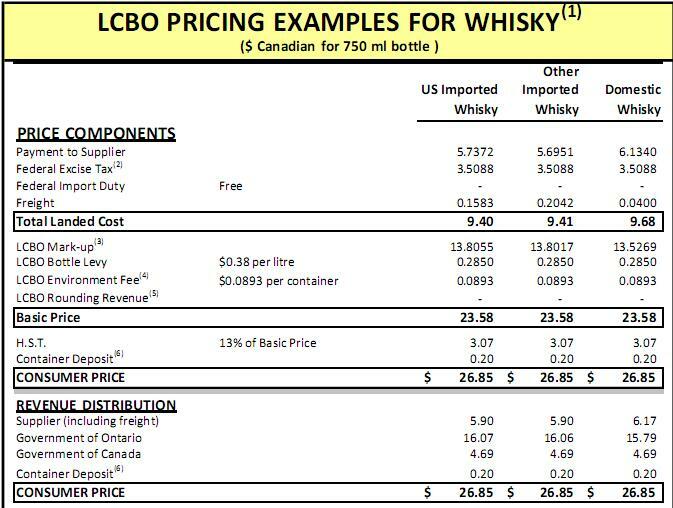 Here is how the LCBO decides on the price for Whisky. So from a 26er of domestic whisky that costs $26.85, $20.48 goes to the government (Federal and Provincial combined). $13.53 of that is just straight mark up while the rest is tax. Similar I know, but not quite the same. Want to know how the government prices your favourite beverage? You can check out all the pricing schemes here. You can then join your friend’s tax rant by saying that you cannot believe how much those tax dollars are wasted by keeping government documents easily available online when no one reads even them. Use the term “bunch of crooks” for added effect. Breaking news: As I am typing this the LCBO has reached an agreement with its workers to avoid a strike. Hooray. I will keep the rest of the post brief. Also, expect a slightly lower quality of editing. Privatizing the LCBO would be an extremely difficult task. First thing to decide is the process. Option 1: Sell the entire thing to a private company and hand them a monopoly. Option 2: Maintain the LCBO locations as they are for a time but allow private companies to open their own stores. Over time reduce the number of government run stores or eliminated them completely. Option 3: Sell each of the stores individually. Selling the whole thing gives the government money upfront but it would need to guarantee some constant level of taxation for something like 99 years, similar to when the Ontario Government sold the 407 highway and gave a 99 year lease agreement. Otherwise if I am an investor I would worry that the government would lure me into buying with the large margins they are making only to increase the taxes levels because they find they still need the $1.55 billion a year the LCBO currently generates even after getting the upfront purchase price. Allowing private companies to open their own stores while keeping the official stores open is what Quebec and BC have done. This would force the province to increase their tax levels significantly. I suspect they would shrink their margins to something more in line with standard retail stores by raising the taxes for everyone; they would essentially be taxing the private companies and themselves to ensure that they still generate the same revenue no matter where you buy your booze. I do not think selling each store individually would be likely. Their lease agreements, shipping contracts, employees, everything would need to be split up by location. This really would be the most difficult of all possibilities. We should also remember that LCBO wages are higher than the average retail level job. This means that any private company that entered this market would either cuts jobs or slash wages. If they cut jobs, those are EI premiums that must be paid out. If they reduce wages, then those workers will pay less income tax. Either way, the government is losing revenue from another angle and this would need to be accounted for in the privatization plan. I was going to write another section here at the end explaining why the prices that the LCBO pays for their booze are likely lower than anything that private companies can hope to get. I had graphs and other interesting things but I think since the strike has been averted I will simplify. If you have one big buyer in a market they will get better prices on their goods than a bunch of smaller players. The LCBO has market power, individual private stores are prices takers. So if you hear someone saying that we pay way too much for our booze because of the taxes and that the LCBO should privatize, now you have a real answer for them. Actually, we currently pay too much because of high markup; if we privatize then we would be paying too much for our booze because of the taxes. Cheaper booze is just wishful thinking.